How to Create Beautiful Foiled Cards Without a Laminator. Today I am making a card using foil and texture - without a laminator. I love the look of foil on cards and am enjoying exploring this medium. But I'm pretty lazy as a card maker and I don't want to purchase a machine or use my laminator to do the foiling. I am more than willing to use what I have on hand and that seems to be working very well. Here is the card and if you are interested, the directions and product list will follow! I select the stamp I want to use for the project, Todays' will be a sympathy card. 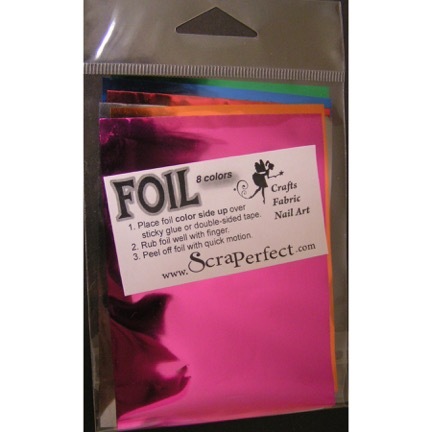 My foils are from ScrapPerfect, I find they are precut to the right size for my card making and come in beautiful color assortments. And I had a beautiful foiled surface; The trick is to let the glue dry! With the BGE, you don't need a separate foiling medium! One less thing occupying desk real estate! This is the sheet after I pulled it off, This beautiful foil sheet will become a background on another card! Unfortunately, this is hard to photo! Coloring for the image - I take my time doing this part and I enjoy doing those swatches. They become a super reference for things in the future. And I do use a color wheel. I feel like I have good color sense but I am always working on enhancing my color use. For this card, I fussy cut the stamped image by hand. Again I hand cut a black border to give a contrasting definition with the strong background patterns. right before I place my images on the card face, I give the card a light swipe with my perfect crafting pouch. This will cause any glue not covered by the foil to stop sticking - I don't want my card sticking in the envelope! I hope you enjoyed this tutorial if you are like me at all you sometimes have to push yourself to try something new! I have always said how amazing and knowledgeable my crafty Yoda Ginny is! Who would have thought you could foil without heat or a laminator. . . Thanks Obi Wan!